The reward for all the effort you put into a production is found most in the satisfaction of bringing dozens of moving parts into perfect harmony. One of the most understated components of any production is the set design. 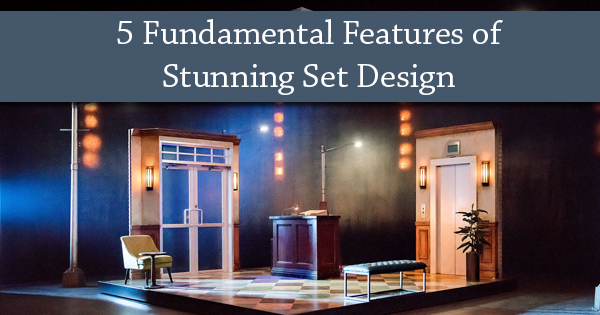 Here are five of the most important components of making the stage come to life with set design. The barrier between an audience and the act, theater drapes help build the connection between observers and performers. Backdrops and ceiling draping kits are used to separate the show from reality, but also to open up the audience to the world before them. Dropping the curtain between scenes can add to the captivating nature of stage performance. You can find this aspect in almost every theater. It's no wonder, then, that the upholstery industry employs some 32,500 people in America alone. This tool is used to create scenery. A flat, two-dimensional surface is painted in accordance with the colors and tone of the play. This is the background canvas in the stage performance world. Tone and temperature are largely decided by what is painted on flats. These are thin pieces of wood that are used to add depth and perspective to the set. They outline features of the setting the play takes place in. Picture the sky and a field as the background. Cutouts could be bushes and trees. Staircases, a porch, multiple stories in a building, and any indication of physical height is accomplished with the use of platforms. Depth and tone are important and so is height. These are moving stage tools. Whether utilized for scene transitions or for part of the scene itself, a wagon is defined as a moving part in a play. Toy train sets qualify as wagons. So does a dolly to wheel in a cabinet in between scenes. Motion in stage performance gives the illusion of time progressing. Another essential dimension of set design. This is the tip of the iceberg for tools used by set designers. Still, each fosters the illusion of an important dimension. Ceiling drapes create the barrier between audience and action, flats create the background, cutouts add perspective, platforms create height, and wagons develop time. Together, these tools create a brilliant set design.